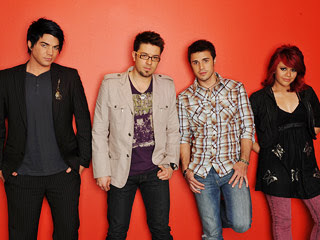 American Idol: Rock Predictions for Our TOP 4! Tonight on American Idol, it's our Top 4 and . . . Slash! Now there's some words I never thought I'd string together in a sentence. I wonder if the Guns & Roses and Velvet Revolver front man will have the ever-present cigarette hanging from his mouth as he mentors our tender, young Idols . . .
No matter. I am READY to ROCK! Tonight should definitely be interesting. Word on the street is that we might be in for a duet treat! Could this be? My dreams coming true of Adam and Allison singing together, just the two of them, on that wondrous Idol stage? Tantalizing me with hints of my Final Two dream? And oh yeah, Kris and Danny can sing together too. Rocker Chick Allison: Is it way too obvious to predict Janis for our lovable little red head? I have to include at least one, so I'll go with "Me & Bobby McGee." Or, she would be great for "I Love Rock & Roll" or maybe even some "Black Velvet." Oh yeah, "Black Velvet" would be SWEET! Danny Gokey: Wow. Now THIS is a hard one for the Michael McDonald sound-a-like. (On a side note, Rock Week could not have come at a better time for my prediction of a Gokey fourth place finish.) But (Gokey lovers), he has surprised me before, and maybe, just maybe, he can do it again? Possibly when pigs fly, but hey, I'm not counting him out. Two words: "Free Bird." Kris Allen: I'm picturing this plaid-loving little puppy dog more in the Bob Dylan, possibly even Lou Reed, vibe. "Tangled Up in Blue"? "Walk on the Wild Side"? But what I would really like to see Kris do is "When Doves Cry." I was reserving it for Adam, but I think it could suit Kris very well. Oh crap. There's always U2 also. ROCK GOD, Mr. Amazing, Second-Coming-Of-Elivs, the Next American Idol, Adam Lambert: (If you're thinking, "gee, at least someone's not biased," I simply reply, "who ME?") Carrying on. Since many compare Adam's vocals to the stylings of Axl Rose, it might be fitting for Adam to sing "Sweet Child Of Mine." Personally, I see him singing "Patience" before that choice, and if he does, ooooohh . . . I will be swaying back and forth just like Axl in my living room, belting along, "I've been walking the streets at night. Just trying to get it right." (Yes. It is very entertaining come 8:00 on a Tuesday night in my humble abode.) Regardless of what my baby sings, I hope he has heard my silent prayer for the past week: "Please, Adam. Don some black leather pants? The tighter. The better? It's just little ol' me . . . Elizabeth. Kisses." What do you all think? Please post any predictions that strike you below. And who do you think will perform last in the pimp slot tonight? It is a fact that Mr. Lambert has never gone first, but would they dare try and do that tonight?! Five hours til showtime! Adam is going to tear the freakin stage down...hopefully they will let him close the show!!! I kinda think Kris will not do well tonight. Danny may suprise us...hum.